This dress is a lot of look. It has lots of colors that don't necessarily go together, it has horizontal stripes, and since it's a maxi, there's a lot of all of it. The cuffs are big and floppy, there are high slits, and yet the buttons allow you to show a little cleavage, if you so desire. It's also silk, and therefore it's incredibly comfortable—I wore it for an entire day and felt like I was in a nightgown. My only criticism is that it's a bit long (I usually wear a lower heel with maxis), so I might actually try belting it the next time I wear it. Then again, getting the length perfect on a maxi is probably quite the challenge, as I have very few that are just right. What goes with a nightgown? A bathrobe! This duster cardigan (last seen here) is technically a sweater, but it's so comfy, it may as well be a bathrobe. When layering with a maxi, you can go either way—short or long—but since it's winter, I decided to maximize my warmth, especially since the dress has high slits on the side. Also, I should note, Sunday was a beautiful day in northern California, and I was lucky enough to be able to wear this outfit without a coat. It probably seems counterintuitive to pair one pattern with another, but, strangely, I think this snakeskin-embossed purse actually complements the stripes in my dress. 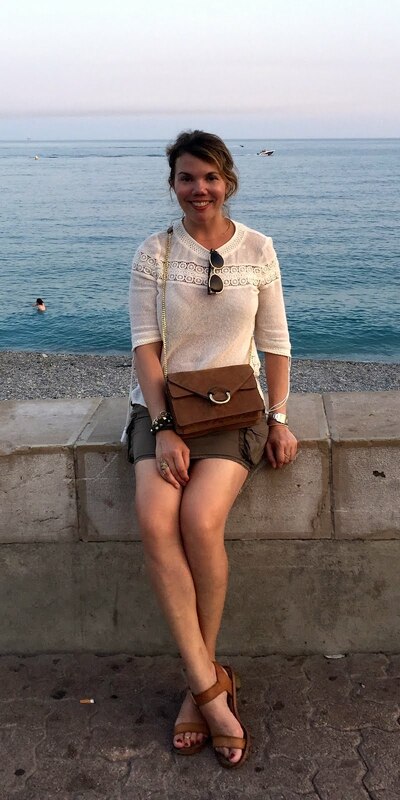 This purse looks bigger and slouchier in the photos than it does in real life; it actually converts to a folded clutch, and it's great for traveling too. It's one of my favorite weekend bags, especially for spring. Since my dress is so busy, I kept my jewelry on the simple side: delicate necklaces, one streamlined bracelet, and a few dainty rings. I thought a longer necklace would look good with this, but it was getting all caught up in the buttons. When it doubt, try it out! I'm glad you gave the dress a shot! I think it's fabulous! The colors are so fun! Yes! I love the dress! 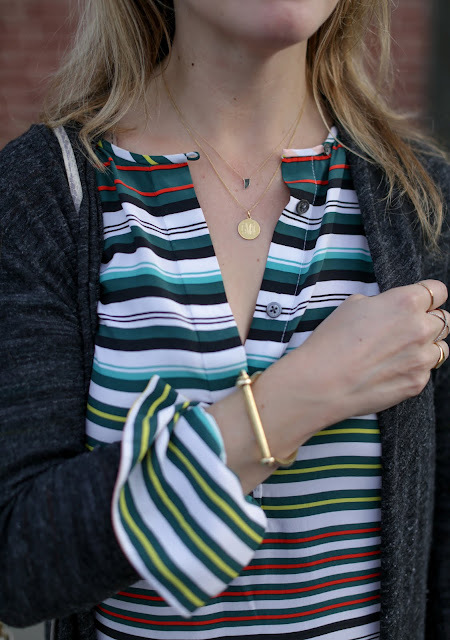 Stripes are always such a classic, but I love the different colors in it! I bought a maxi dress once, and I was on the fence about it too. But it ended up being surprisingly flattering. It made me look like I was 10 pounds thinner than I really am! 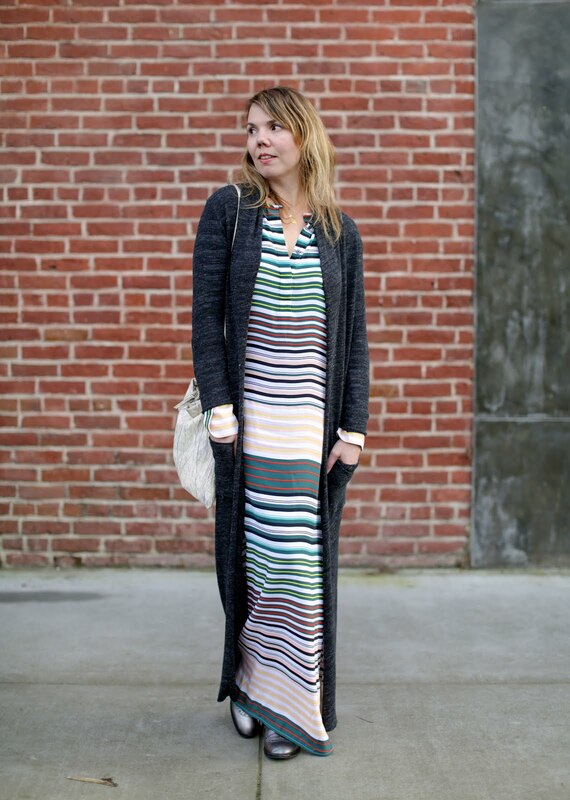 What a great maxi dress and I'm LOVING that sweater!